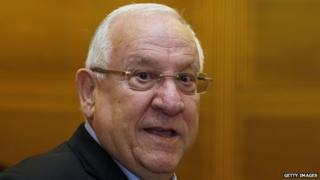 Veteran politician Reuven "Rubi" Rivlin has been elected President of Israel by members of the Knesset (parliament). A member of the right-wing Likud party of Prime Minister Binyamin Netanyahu, Mr Rivlin is known to oppose the creation of an independent Palestinian state. In 2010 he said: "I would prefer to have Palestinians as citizens of this country over dividing the land up." Reuven Rivlin beat off a strong challenge for the presidency from Meir Sheetrit, whose appeal to members from the left and centre was said to stem from his support for a two-state solution. In a recent interview, Mr Rivlin gave his view on the role of the presidency, an office which is largely ceremonial. "The president is the face of the State of Israel around the world, not a representative of a specific ideology but of the collective creativity and history of the Jewish people," he said. Mr Rivlin is known for his broad popularity in the Israeli parliament, which was demonstrated by the cross-party support he won in the presidential election and when he was named Speaker in 2003. As former Likud MP Zalman Shoval once said of him: "His supporters in the Knesset come from across the political spectrum and back him because of his personality and not necessarily for his political views." Indeed Mr Rivlin's outspoken opinions have led to series of high profile disputes with key figures in the Israeli government. Prime Minister Netanyahu reluctantly endorsed Mr Rivlin's candidacy in a speech described as "lukewarm" by the Haaretz newspaper. The Yediot Ahranot newspaper said the prime minister had become "obsessed" with preventing Mr Rivlin from getting the job. Reuven Rivlin even fell out with one of his closest allies, former Prime Minister Ariel Sharon, over the policy of disengagement from Gaza, which saw the withdrawal of Israeli troops and the dismantling of Israeli settlements. His outspoken opposition led to a deterioration in his relationship with the then prime minister, and by 2004 the pair were said to be barely on speaking terms. He later said that he had refused a position in Sharon's cabinet because of the dispute. In 2005 Rivlin told an Israeli newspaper that he managed to reconcile his personal opinions on disengagement with his official responsibility as Knesset Speaker. This urge to temper his own opinions in the interest of the country was re-stated in a recent article for the Times of Israel newspaper, in which he acknowledged that the authority of the president is only possible if the postholder "observes strict political neutrality and adheres to the ideal of non-partisanship for which he was elected". The 74-year-old father-of-four was born in Jerusalem to a family whose roots in the city date back to the early 19th Century. A lawyer by profession, he has served as chairman of Betar Jerusalem sports association, which is known for its affiliation to Likud, and is a loyal supporter of their football team. He strongly identifies with the city, describing himself as "a man of Jerusalem". He was first elected to the Knesset in 1988, but lost his seat four years later. He returned to parliament in 1996 and kept his seat in elections in 1999. He served as minister of communications in the government of Ariel Sharon between 2001 and 2003. After his uncontested victory in the election for Knesset Speaker he said: "Every one of the public's representatives has the right to be heard here. Every opinion must be suffered. One must listen to what may be rousing, annoying, even shocking, but it must be done honestly, fairly and with equanimity, respecting the rights of every Member of the Knesset and each faction, guarding the minority in the face of the predatory majority.